Some of these chicken recipes have more ingredients than you might want to bring with you camping. My suggestion, especially for the spices, is to plan ahead, measure out and bag your spices in Ziploc bags, labeled for each recipe. That way you aren't having to bring a whole spice cabinet on your camping trip. Other ingredients, such as rice, can also be measured out and put into Ziploc bags for each recipe. 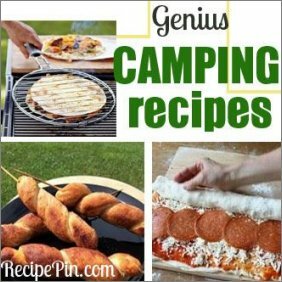 Now you have made each recipe easy to make and can enjoy your time camping. 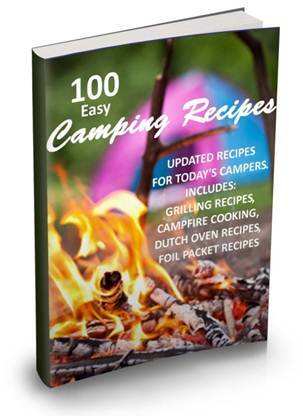 And if you are looking for super easy camping recipes for chicken, try my 100 Easy Camping Recipes book. 1 can red enchilada sauce, 10 oz. Tear tortillas into bite-size pieces. Spray skillet with non-stick spray. Place chicken and tortillas into skillet and place on high heat until hot, stirring as it cooks. Pour canned ingredients over chicken and mix well. Sprinkle half of the shredded cheese on top, cover skillet and cook until boiling, stir occasionally. Remove from fire and sprinkle with remaining cheese. 1 Rotisserie chicken, 2 lbs. Tear off 4 foil squares. Cut asparagus into 1 inch pieces. Shred chicken and place even portions on each piece of foil. Place even portions of asparagus and mushrooms on top of chicken. Spoon 4 tablespoons of the tomato soup on top of asparagus and mushrooms. Season with salt and pepper to taste. Fold packets up until they are sealed tight but leave a little room between food and foil packet for heat circulation and expansion. Cook over medium heat until good and hot; about 15 minutes. Serve in or out of foil packets. Make a large pocket out of foil. In a bowl or sack, mix chicken wings with garlic and herb seasoning and place in foil pocket. Fold pocket edges down for a tight seal; leaving room for air circulation and expansion. Cook for approximately 1 hour. Chicken should be slightly crispy. Carefully unfold foil and eat around the campfire. Chop chicken into 1" square pieces. Place all the ingredients in a frying pan, making sure to break up the chicken cubes. Cook over campfire for approximately 20 minutes or until chicken is cooked throughout. Serve with brown or white rice if desired. Tip: The day before you leave to go camping, chop chicken into cubes approximately 1 inch square. Wrap chicken cubes in foil and place overnight in freezer. The next day, right before leaving, take the frozen chicken cubes and wrap them with a second layer of foil. 1 can pineapple chunks, 8 oz. Preheat grill. Tear off 4 pieces (18 x 12 inches) of heavy-duty aluminum foil and spray with cooking spray. Place one chicken breastin the center of each foil square and top with a single tablespoon of the sweet and sour sauce and 1/4 of the pineapple chunks. Add equal portions of pepper slices and onion wedges. Top off with the remaining sweet and sour sauce. Fold the foil over veggies and chicken, make sure the edges meet evenly. Seal the edges tightly, then fold again or use another piece of foil. Allow some room for heat expansion. Place the foil packets on grill over medium heat then cover grill. Let cook approximately 15 to 20 minutes, rotate packets a half turn every 10 minutes. Juice of chicken should be clear when done. Place packets on serving plate and with a sharp knife cut an X on top, then fold back the cut edges. Place a portion of noodles on top and serve. Yield: 4 servings. Dice chicken breast. In a Dutch oven or large skillet, saute chicken in oil until done. Add minced garlic and sliced mushrooms, stirring until the mushrooms are cooked. Pour in green beans and chicken broth. Cook until boiling. Remove pan from heat and add rice. Cover for at least 5 minutes and serve. 1 pkg. fresh sliced mushrooms, 8 oz. Cube boneless chicken. Place all the ingredients into a zip-top bag and mix well. Tear off 4 large sheets of foil. Place even portions of the chicken mixture on the center of each foil square. Top each foil square with another sheet of foil and match the edges, then fold the edges together tightly, leaving room for air circulation and expansion. Wrap packets with an additional piece of foil and cook in the hot coals of your campfire. Let packets cook for approximately 40 minutes. Chicken should be opaque in color and potatoes should be tender when done. Wrap tortillas in foil and place near the campfire to slowly heat. Thinly slice chicken breast, then slice bell pepper and onion, mix all together with fajita seasoning and water. Tear off four pieces of foil and place equal portions of the fajita mixture on each foil square. Fold each foil square in half, matching the ends, then fold ends tightly to secure. Foil packet should be air tight. 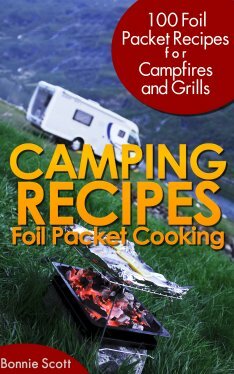 Place prepared foil packet on hot coals or a campfire grill. Packets should not be placed directly in the fire. Chicken is done when the juice from the chicken runs clear. To serve, place fajita mixture on a flour tortilla and top with your favorite toppings, then roll up the tortilla and enjoy. Tear off two large pieces of foil. Place one chicken breast and equal portions of veggies on each foil square. Sprinkle with dill, sage, salt, pepper and water. Fold the foil around the chicken and veggies and tightly seal, leaving some room for expansion. 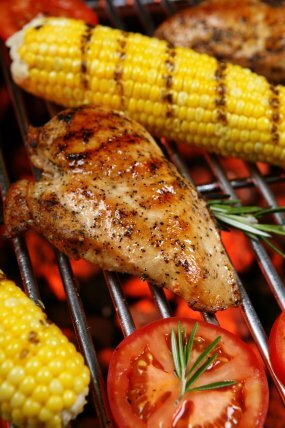 Place packets on a campfire grilling rack over medium heat for approximately 30 to 40 minutes or until chicken juices run clear.